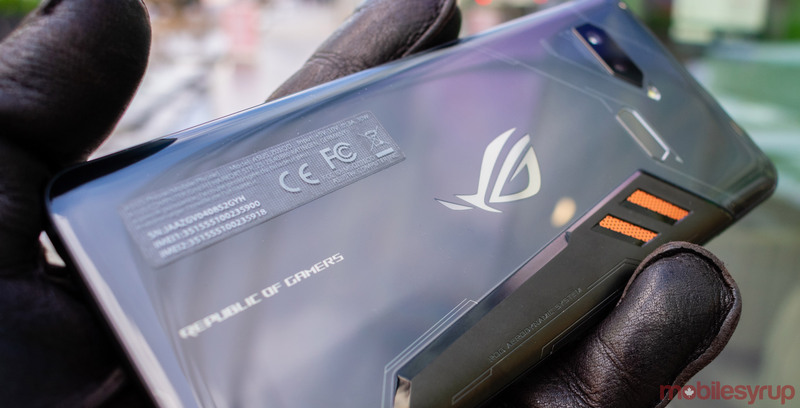 At first glance, Asus’s ROG Phone is the kind of device seemingly designed to strike fear into the hearts of one’s enemies. The phone itself is all hard lines and striking angles, made of distinct metal and glass and emblazoned with a logo that looks like something straight out of a edgy 90s comic book. After all, the ROG Phone is an expensive, premium-tier, flagship Android smartphone that floats in a sea full of expensive, premium-tier, flagship Android smartphones — all of which offer users with experiences that are either comparable or just plain better. The difference between a gaming computer and a regular computer is usually a notable one, with gaming machines featuring high-powered CPUs, GPUs capable of rendering video games at rates reaching 60-frames-per-second and enough RAM to process even the most taxing of tasks. Due to the precedent set by gaming computers, one would expect the spec differences between a premium-tier, flagship Android smartphone and a branded gaming phone to be as stark as the difference between a gaming machine and a normal desktop or laptop. 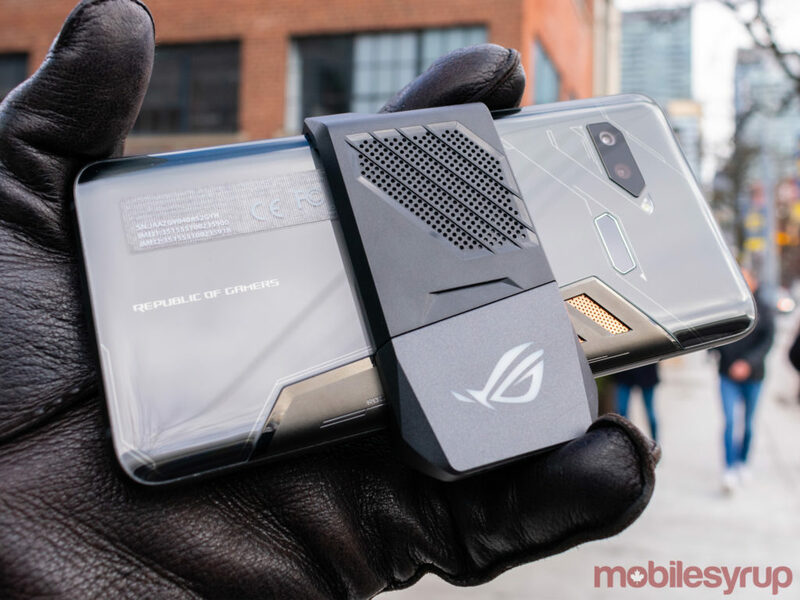 However, as proven by Asus and its ROG Phone, those differences aren’t necessarily notable enough to warrant choosing a branded gaming phone over a premium-tier device like a Samsung Galaxy S9 or a Google Pixel 3 — even if those two specific devices do have smaller screens than the Asus ROG Phone. Still, the ROG Phone’s internal specs are admittedly beefy, even if they aren’t substantially beefier than what one can find on comparably priced premium-tier phones. To begin with, the phone features a 6-inch, 18:9, 2,160 x 1,080 pixel resolution AMOLED display with a default 60Hz refresh rate that can be increased to 90Hz. Sadly, the display is rather unremarkable, not just because the phone’s larger form factor doesn’t accommodate the display’s disappointing pixel resolution, but because the AMOLED features the same minor jelly-scrolling issue that plagues all OLED panels. The scrolling problem can be fixed by bumping up the screen’s refresh rate to 90Hz, but the improved refresh rate doesn’t resolve the screen’s boring colour gamut or its low resolution. Though the panel is remarkably bright, the ROG Phone’s display is unimpressive compared to OLED screens found on other premium-tier Android flagships — like the ones in the Galaxy S9/S9+, the Note9 and even the OnePlus 6T — but it’s still a serviceable panel that works whether consuming video content or playing video games. In terms of performance, the ROG Phone also comes equipped with a Qualcomm Snapdragon 845 processor, an Adreno 630 GPU, 8GB of RAM and 128GB or 512GB of UFS2.1 storage. The phone’s Snapdragon 845 CPU is outdated in 2019, though the processor continues to be able to render resource-intensive 3D games like PUBG Mobile, Oddworld: Stranger’s Wrath, Modern Combat 4: Zero Hour and the titles in Square Enix Montreal’s GO series. Coupled with the phone’s welcome 8GB of RAM, the ROG Phone never stuttered or slowed down, even while simultaneously streaming audio and playing games. On the subject of heat management, thanks to the phone’s built-in copper heat spreader and its carbon cooling pads, the ROG didn’t become hot under load, staying warm even during intense online gaming sessions. Despite the phone’s relatively modern processor, the device disappointingly runs Android 8.1.0 Oreo, with no clear sign when the device will receive an Android 9 Pie update — if Asus ever plans on updating the ROG Phone at all. This is a common concern with Android smartphones, and users should be aware that they may never receive an Android 9 Pie update if they decide to purchase this $1,200 device. It’s worth noting that MobileSyrup has contacted Asus to inquire about a potential Android 9 Pie update, but we’ve yet to receive a response. The phone’s main rear camera features a 12-megapixel Sony sensor and an f1.8 aperture lens with 83-degrees field-of-view. The second rear camera is a 120-degree wide-angle shooter. The phone’s front-facing selfie camera has an 8-megapixel sensor with an f2.0 aperture lens and 84-degree field-of-view. In terms of additional hardware, the ROG Phone packs in loud, dual front-firing speakers, a rear-facing fingerprint sensor, two USB-C ports, a “side-mount connector” necessary to connect an external fan peripheral to the phone and, mercifully, a 3.5mm headphone jack. The device also has two ultrasonic ‘AirTriggers’ that function as shoulder buttons in certain games. Additionally, users can squeeze the ROG Phone to launch any app that’s been downloaded. The squeeze function enables users to access certain system settings, like screen rotation, while carrying out tasks like screenshots. Users can even set up the ROG Phone to launch Google Assistant — like Active Edge with Google’s Pixel 2 and Pixel 3 line of phones. 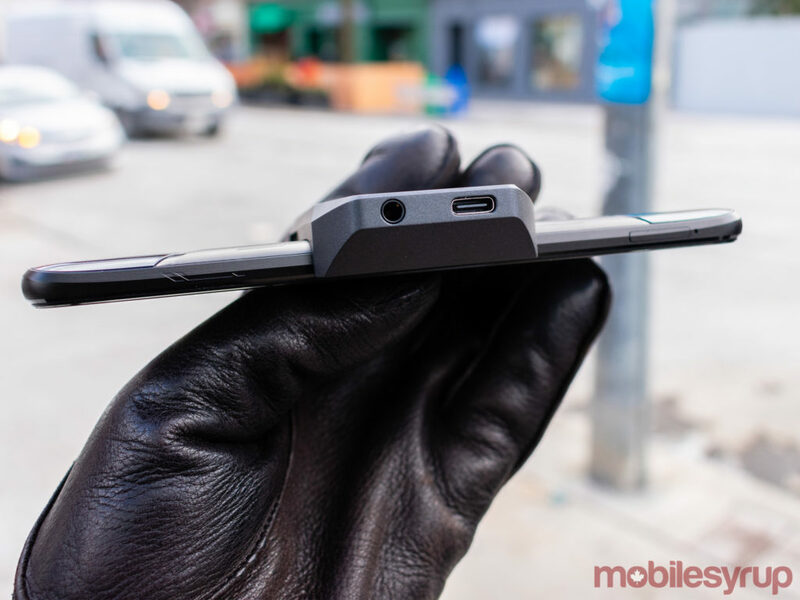 The phone’s two USB-C ports are located on the bottom-left of the device, as well as the right above the ROG Phone’s side-mount connector. That side-mount connector closely resembles a USB-C port, but it’s not possible to charge the phone using the connector. However, the fan peripheral included in the ROG Phone box does feature a USB-C port for charging and a headphone jack, meaning that the device can be upgraded through a hardware peripheral to include two headphone jacks and two USB-C ports. Suffice it to say, the port selection on the ROG Phone is among the best I’ve ever seen on a premium-tier Android smartphone released after 2016. Finally, the ROG Phone features a gargantuan 4,000mAh battery that comfortably lasted two days with moderate-to-heavy use, and a full 7 a.m. to 11:59 p.m. day of podcasts, music streaming, Netflix downloads, YouTube, Slack, Twitter, Instagram, Reddit and, of course, gaming. 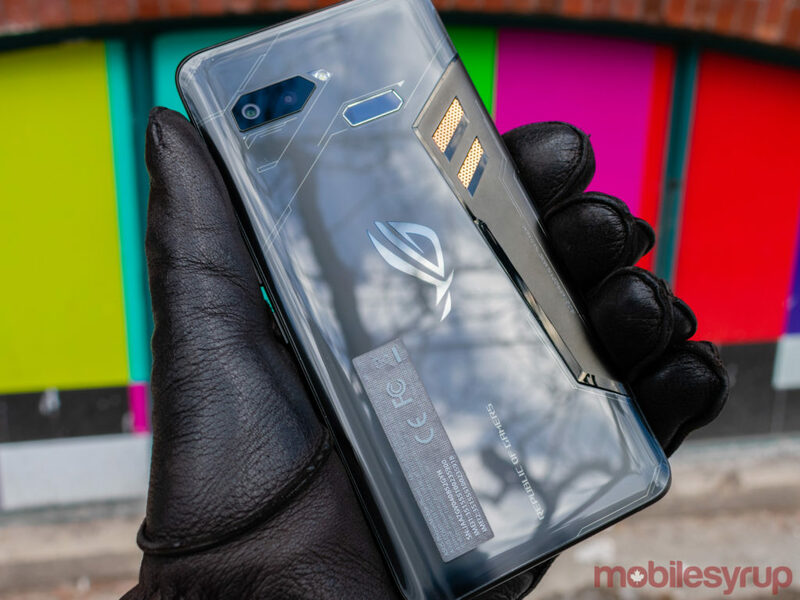 Quite frankly, if there’s any one reason to get the ROG Phone over a comparable device, like the Samsung Galaxy S9+ or the costlier Galaxy Note9, it’s the Asus device’s stellar battery. That being said, the phone’s hardware elements don’t help hide the fact that the ROG Phone is a big, bold smartphone. The device’s metal and glass aesthetic are common for today’s smartphones, but the sharp lines, angular design and overall gamer aesthetic — as well as a logo that lights up in a variety of colour combinations — speaks to Asus’ attempts at cornering the gaming phone niche. 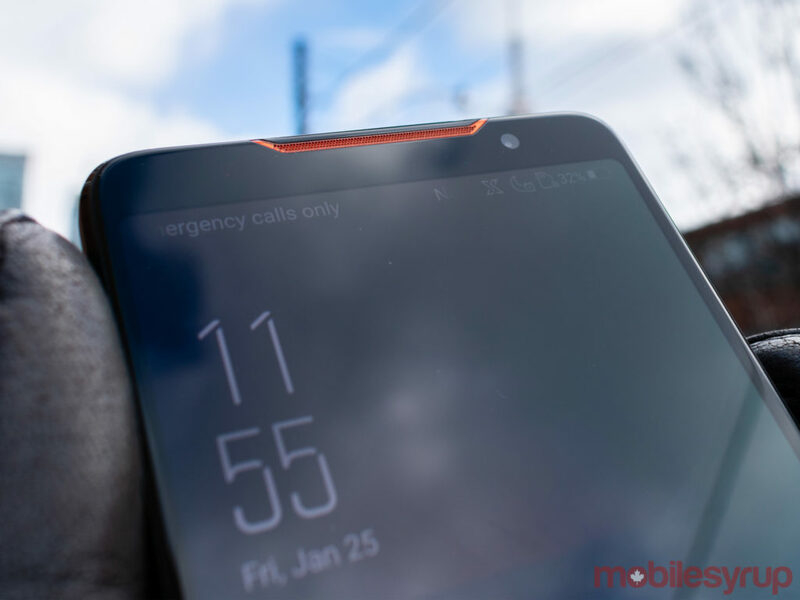 Sadly, unlike the Razer Phone’s subdued black and green aesthetic, Asus went with a gunmetal grey and orange combination that makes the phone look like it stepped out a cyberpunk filmmakers wildest dreams. That gamer aesthetic extends to the phone’s user interface, which actually strikes a welcome balance between gamer and early versions of Android. In the phone’s standard mode, Asus’ ZenUI lights up the device with neon reds, greens, blues and yellows. 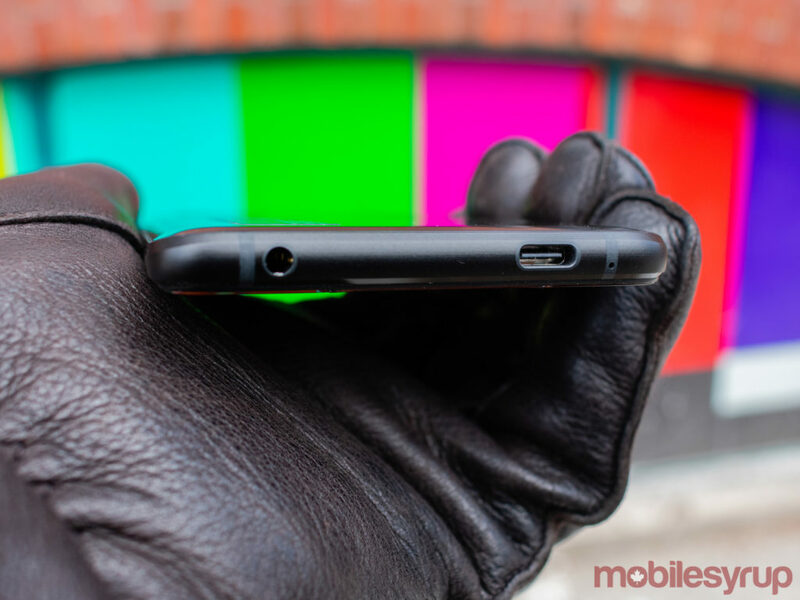 When users activate X-Mode, however, the phone’s colour drains away, revealing a cybernetic red that hurts the eyes but nonetheless pumps blood through users’ veins. In short, if you like the kitschy-yet-popular gamer aesthetic — or if you want a phone that isn’t yet another boring white or black rectangle — then you’ll be comfortable with the ROG Phone’s design philosophy. Otherwise, this phone is unapologetically ostentatious. Before I continue, I must admit to loving my time with the Asus ROG Phone. It’s fast, powerful, loud and other than its less-than-impressive camera (more on that later), the phone proved to be quite useful and effective. Despite my affection for the handset, it’s difficult to recommend the ROG Phone for its merits as a gaming phone. Once again, while the distinctions between gaming computers and regular computers are stark, the distinctions between this particular gaming phone and regular premium-tier smartphones aren’t as notable. Yes, Asus packed in top-of-the-line hardware — excluding the phone’s display — but other premium-tier smartphones also come with 8GB of RAM and ample amounts of internal storage. As a form of making up for its lack of distinguishing hardware, Asus packed in a suite of gaming-related software tweaks no doubt as a way of complimenting the phone’s hardware. However, that gaming software — dubbed ‘Game Center’ and labeled with an angular neon ‘G’ to distinguish the app from the Google app — doesn’t seem designed to appeal to gamers, so much as it seems like a way for Asus to make it easier for ROG Phone users to find all of the phone’s customization features in a single location. Case in point, all of the Game Center’s features can be found in various menus and submenus tucked away in the phone’s default ‘Settings’ app, ultimately negating the need for a dedicated game center in the first place. Additionally, none of the phone’s supposed gamer-centric features functionally make the phone better for mobile gamers. 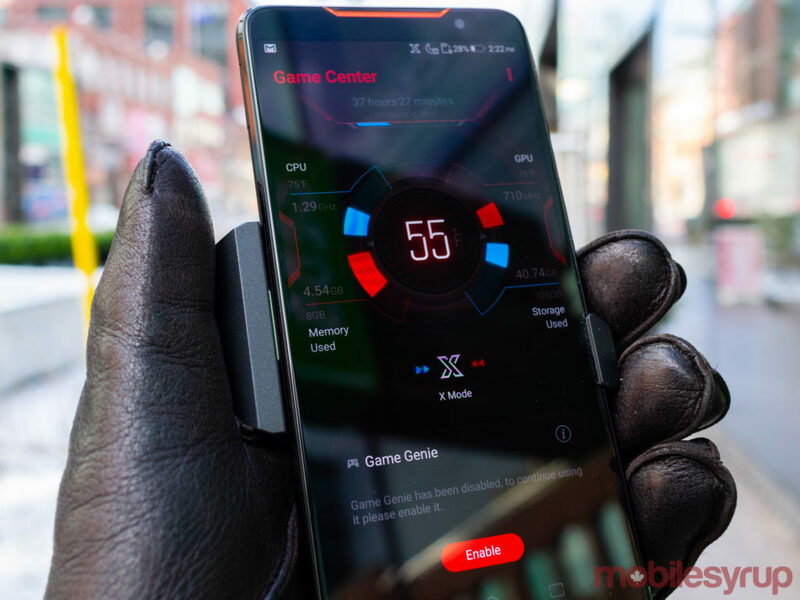 Certainly, users can improve the ROG Phone screen’s refresh rate and boost the phone’s performance even while at rest with ‘X-Mode’, but other than providing a snapshot of the CPU’s and GPU’s clock speeds — as well as the phone’s temperature — none of the features provided through the Game Center are features that can’t be found elsewhere. This lack of distinction between the ROG Phone’s gamer features and the normal software suite that comes with non-Google-branded premium-tier handsets, plagues most of the so-called gaming phones available for purchase today. 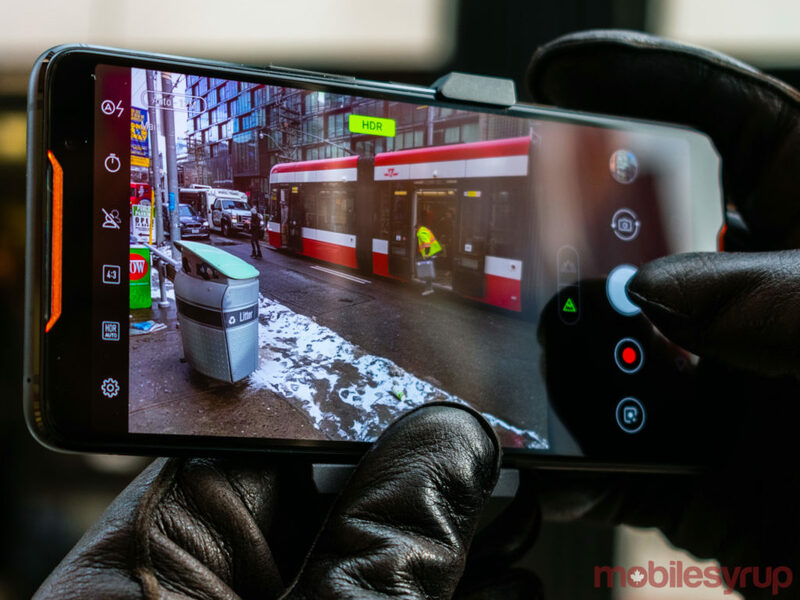 Simply put, there’s no need for anyone in 2019 to purchase a gaming phone if the phone itself doesn’t feature better hardware or software than other comparably specced and similarly priced smartphones. That’s to say nothing of the fact that even the most resource-intensive Android apps don’t require more than 4GB of RAM, even if future-proofing dictates that users should opt for smartphones with more RAM when the opportunity presents itself. To prove this point, I played the same games on the ROG Phone and on my personal Google Pixel 3, and while my Pixel definitely got warmer than the ROG Phone, both devices handled most of the same apps equally well. The exception to this rule seemed to be PUBG Mobile, which seemed to perform better on the ROG Phone. However, I stand by my earlier critique of the gaming phone label, simply because PUBG might be the only app that allows the ROG Phone to shine. I also don’t personally gauge phone quality based on whether or not a potential purchase can smoothly withstand multiple games of PUBG. That being said, I’m not convinced that the ROG Phone’s primary competitors are devices like the OnePlus 6T or the Google Pixel 3 or the Samsung Galaxy S9+. Instead, the Asus phone’s main competition is likely a handset like the Samsung Galaxy Note 9. 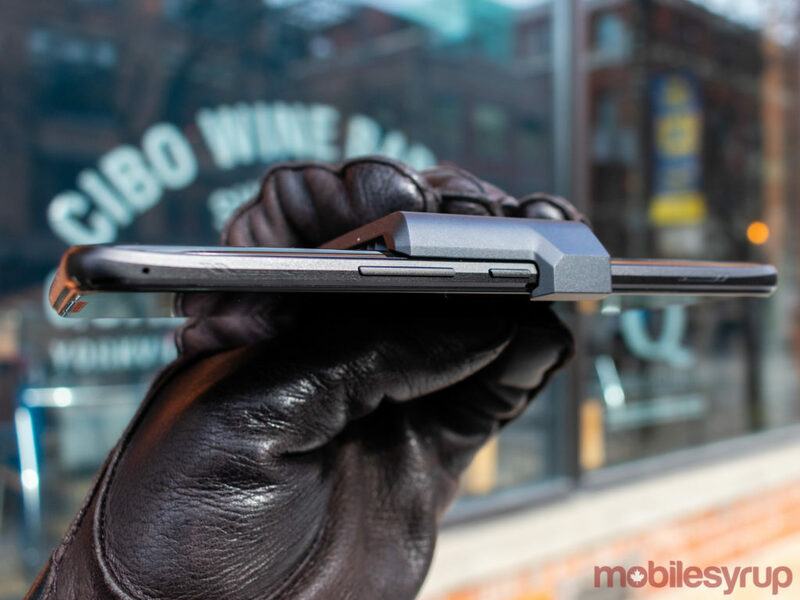 Truth be told, I haven’t spent very much time testing Samsung’s latest phablet device. However, having played with the Note 9 when it floated around the MobileSyrup offices, I can safely say that the Samsung device radically outperforms the ROG Phone. Yes, Samsung’s phablet is approximately $300 more expensive than Asus’s gaming phone, but the Galaxy Note 9’s superior screen, superior design, superior software suite, superior camera and even its superior gimmicks means that when compared, the ROG Phone doesn’t really hold a candle to the Note 9. As a final point, the ROG Phone is compatible with a collection of Asus-branded peripherals including a dual-screen controller case, a dock that allows users to connect the ROG Phone to a keyboard, mouse and monitor, and even a display dock that effectively turns the ROG Phone into an Android-capable Nintendo Switch. However, Asus didn’t provide MobileSyrup with review units and I haven’t had the chance to test those peripherals. Even with these accessories, however, the ROG Phone still exists as a solution to a problem no one really had in the first place. In short, premium-tier Android flagships are already plenty powerful as it is, and the ROG Phone doesn’t stand up to its premium-tier competition in any particular category. Despite my criticism of the ROG Phone’s gaming capacity, the device is still a relatively impressive smartphone. 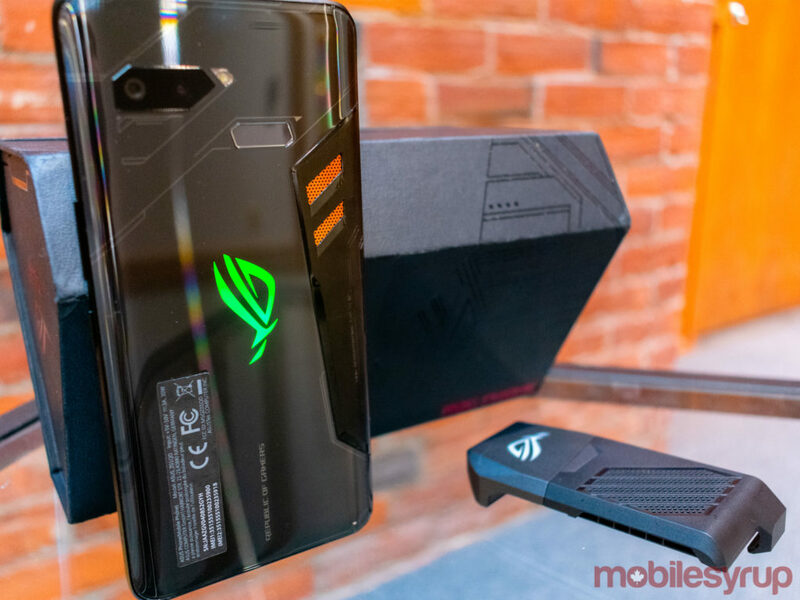 Sadly, the device’s camera doesn’t truly impress, and when compared to its premium-tier competition, the ROG Phone’s rear shooters fail to stack up to any of the aforementioned devices. It’s not that the phone takes bad photos by any means. Once again, users will be confident in uploading photos taken on the ROG Phone to social media, nor is the issue that Asus failed to build a phone using impressive hardware. Instead, the central problem with the ROG Phone’s camera is that its post-processing features often produce photos that are too bright, too loud or just plain boring. Whereas my Pixel 3 is capable of turning even the most mundane product shot into something visually expressive, the ROG Phone simply captures whatever it sees, with minimal frills. The phone’s video camera doesn’t perform much better. Like many phones available today, Asus claims that the ROG Phone can record 4K footage at 60-frames-per-second, which might be technically true even if the footage doesn’t mimic reality like a real 4K camera would. Sadly, the phone’s camera woes are exacerbated by the presence of that six-inch, 2,160 x 1,080 pixel resolution AMOLED display. If the phone can actually record 4K footage, users certainly wouldn’t know because the device’s disappointing display turns even the best images and videos sour. Despite my numerous concerns about the Asus ROG Phone, it’s important that readers don’t leave with the impression that it’s a bad phone. By no means is the ROG Phone a bad phone. In fact, I’d go so far as to say that it’s a great phone. However, the device’s disappointing screen, weak camera software and ostentatious gamer aesthetic make the ROG Phone difficult to recommend to the so-called average consumer. "I loved the Asus ROG Phone, but despite my admiration for the device, I'm forced to acknowledge that it's not the best smartphone for its intended purpose."